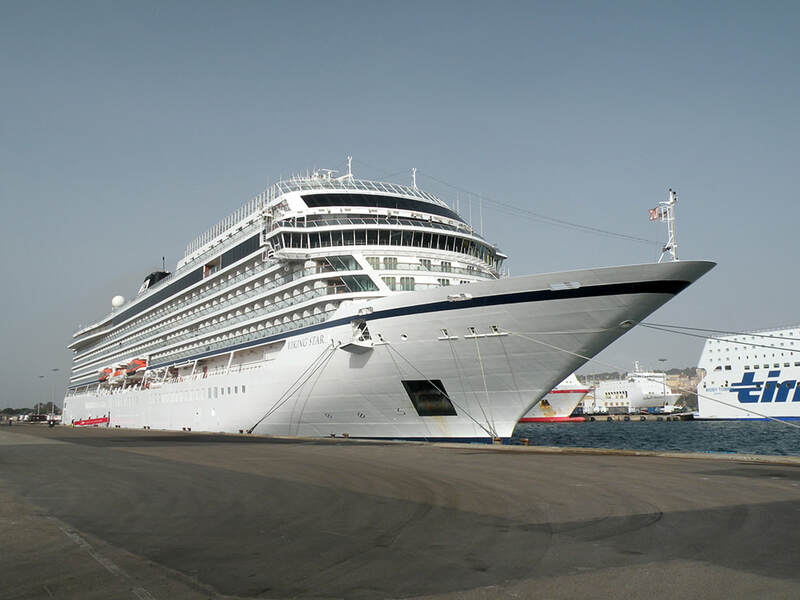 This was a seven night Mediterranean cruise on Viking Cruise Line’s Viking Star. It began in Rome and ended in Barcelona. Viking Star entered service in 2015 as the first ship of what is intended to be a custom-built fleet of ten 48,000 gross-ton ships. The first four ships bear names reminiscent of the ships of the now defunct Royal Viking Line. The Viking Star was followed by the Viking Sea, Viking Sky and Viking Sun. The fifth ship in the fleet is named Viking Orion and the sixth ship, to be named Viking Jupiter, will enter service this year. The last four ships have not yet been built. Each ship is 745 feet long with a beam of 94.5 feet. They are designed with a top service speed of 20 knots. Each ship can carry 930 passengers and all staterooms have balconies. There are no interior cabins for passengers. The ships are designed as five-star luxury ships. The target market is people 55 and older, although the minimum age is 16. Most of the people of our cruise were 70 or older, but there were some people in their 20’s and 30’s. At Rome’s Fiumicino airport. Here we were met in the baggage pick-up area by several Viking representatives wearing red scarves or jackets. Our bags were collected from us and transported by truck to the ship. The passengers were driven by motor coach to the port of Civitavecchia. We arrived at the cruise terminal at about noon. A host of agents were ready to check us in. We quickly boarded the ship but the staterooms were not ready to receive passengers and so we proceeded up to the World Café on Deck 7 for a leisurely lunch. After lunch we explored the ship. We noticed people camped out on the relining chairs and couches in the lobby area around the three-deck Atrium, waiting for an announcement about the availability of the staterooms. One women, presumably tired from her overnight flight, was sleeping on one of the couches. Soon enough, the announcement came and we and everyone else headed to our staterooms. On our cruise, there were a total of 890 passengers and 461 crew. One advantage to our cruise was that the ship remained in Civitavecchia overnight and did not leave until 5:00 PM on the following day. Thus, the new arrivals on board were able to recover from jet lag on the first day and enjoy one of the many tours of Rome on the second day. Our cruise had originally been scheduled to visit Trapani in Sicily, La Goulette in Tunisia, Caglieri in Sardinia, Algiers in Algeria and Valencia in Spain, before arriving in Barcelona for disembarkation. However, approximately two weeks before the cruise, we were advised that the ports of La Goulette and Algiers had been scratched due to State Department warnings issued soon after President Trump’s recognition of Jerusalem as the capital of Israel. This was a major disappointment to us, since the only reason we booked the cruise was to visit La Goulette and Algiers. We were told that two new ports, Naples and Palma de Mallorca would be substituted for the scratched ports. While these ports have their own interesting sites, we were not consoled. One interesting effect of the change of ports was that a VAT of 22% was added to all purchases made in the on-board gift shops, since the cruise no longer would go to ports outside of the European Union. We did not see heavy use of these gift shops, which concentrated on jewelry, watches and perfumes, with precious little in the way of ship souvenirs. I saw only caps and tee shirts with the Viking logo. While we were still in Civitavecchia, we were told that there had been yet another change to our itinerary. Because of strong winds forecasted in the area of Trapani in Sicily, the captain elected to dock in the port of Palermo instead. Fortunately, most of the tours which were originally planned for Trapani were available from Palermo, although at a greater driving distance. As expected, the free tours of Trapani were changed to free tours of Palermo. Viking Ocean Cruises has built its product around destination immersion. One of the signature features of the Viking ocean cruise ships is that one or more free tours are provided in every port in addition to premium tours for which you pay an extra charge. We elected to take two tours for which there was an extra charge, one in Sicily to visit the Greek ruins in Selinunte and one in Palma to visit Son Marroig, an estate of the last Hapsburg emperor. In each case, the extra charge was low by cruise industry standards. In all of the other ports, including Rome, we took one of the free tours and found them to be very good. In Rome in particular, the free tour was six hours long and included extended stops at the site of the Circus Maximus and at St. Peter’s Square in addition to driving by the Colosseum, the Arch of Constantine, the baths of Caracalla, the pyramid of Cestius, the Victor Emmanuel Monument and many other sites. Among the other signature features of the Viking ocean cruise ships is free wi-fi for passengers and crew, free use of the indoor spa pool and free specialty restaurants, subject only to making a reservation, since space is more limited in these restaurants. We tried Manfredi’s, an Italian restaurant and found it excellent. At the other free specialty restaurant, The Chef’s Table, the chef determines the menus for the day based upon local ingredients. I assume that some passengers are curious to find out what the chef is preparing, but you have to make a reservation far in advance of the day on which the chef decides the theme for the day. 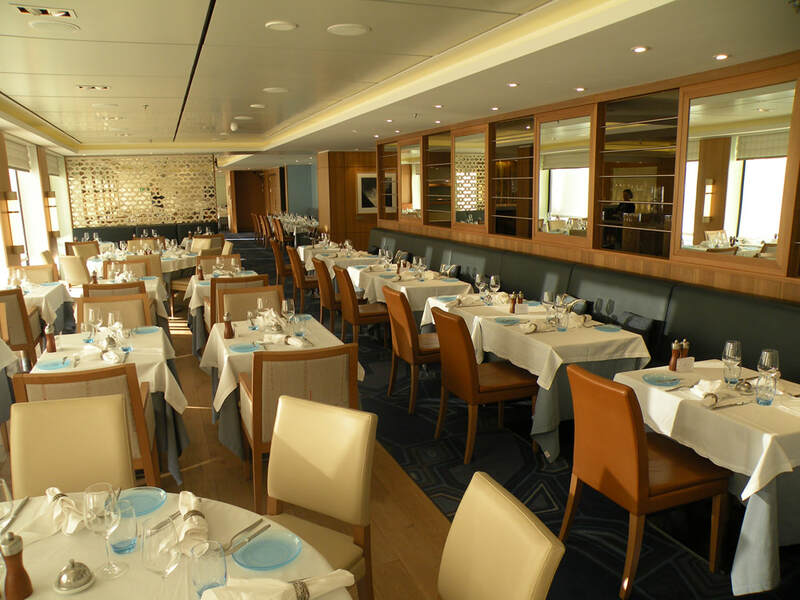 These specialty restaurants are located on Deck 1, with The Chef’s Table on the port side and Manfredi’s on the starboard side. There is a third specialty restaurant on Deck 1, The Kitchen Table. It is available only once or twice a cruise and there is a charge of $199.00 per person. To start, passengers go ashore with the chef in the morning to shop for ingredients at a local food market. At dinnertime, the passengers help prepare the meal. Dinner is served with special wines selected by the sommelier. The main restaurant, aptly named The Restaurant, is on Deck 2 aft. Entry is on the starboard side, but there are tables on both sides and at the stern. The Restaurant has open seating. There are no fixed dining times. When you request a table, the maître d’ asks for your stateroom number. He then assigns you a table and you are escorted to the table. Each of the servers carries an Apple iPhone, on which is displayed the names of the passengers assigned to the table. The server will often greet you by name. Your order will be entered into the server’s iPhone. Thus, the ship has a record of everything you eat in The Restaurant during the cruise. The galley is in the middle of The Restaurant. There are no visible serving stations. All of the meals are served plated from the galley, although there may very well be serving stations within the galley area. This made The Restaurant seem more like a land-based restaurant than what is normally found on a ship. The right side of the menu offers a good selection of food, although I found that there were somewhat less entrée selections than on Cunard Line and Holland America Line. However, as on Princess Cruise Line and Royal Caribbean International, the left side of the menu has selections that are available at all times, including steak, chicken and salmon, so any lack of choice on the right side is mitigated. The food and service were uniformly very good. The Restaurant is surrounded on three sides by the promenade deck, so you have good views of those walking by and they of you. This is reminiscent of the King’s Court restaurant on Cunard Line’s Queen Mary 2. The dress code in The Restaurant was decidedly casual, not elegant casual as stated in the daily program. Jeans and sneakers were a common sight. One passenger wore a tee shirt for two straight days. On the third day, he wore another tee shirt. There was very little sartorial splendor, very few jackets and even fewer ties. The World Café is the Viking equivalent of the lido restaurants on modern cruise ships. It had a very nice selection of food, some of which was made to order in the full-view kitchen in the middle of the ship. Similar food stations were set up on both sides of the ship, although ice cream was available only on the port side and pizza was available only on the starboard side. Of particular note, each day there was a different list of ten flavors of ice cream. Seating was along the sides and back of the ship. Those at the back opened up to the Aquavit Terrace on the stern. Here outdoor tables and loungers surrounded a hot tub and an infinity pool. A promenade deck surrounded the sides of the World Café and sliding doors opened up onto this promenade. These doors were not opened during our cruise, since the temperatures never rose above the mid 60 degrees Fahrenheit. This promenade was cantilevered out from the side of the ship on each side of the ship, overhanging Deck 6. The promenade only extended the length of the World Café and terminated at the midship pool area covered by the magrodome. White and red wine, beer and soft drinks are provided free of charge during lunch and dinner in the restaurants and the World Café. The free wines offered were generally blends from Bordeaux. Varietal wines were available for purchase. At the entrance to the lower level of the Explorers’ Lounge on the starboard of Deck 7 is a small food station called Mamsen’s. This food station is open for early breakfast, lunch and afternoon snacks. * David G. Hume is past chairman of the World Ship Society PONY Branch, Mr. Hume has been on more than 75 cruises and crossings as well as numerous ship visits." Forward of the pool on Deck 7 is the Wintergarden. This is a pleasant airy room, although permanently covered by the magrodome. Afternoon tea is served here from 4:00 PM to 5:00 PM, accompanied by either a pianist or the Viking classical trio. At afternoon tea, each passenger is given an individual pot of tea of his or her choosing and each couple receives a three-tiered plate stand containing four finger sandwiches on each of the lower plates and four pastries on the top plate. Scones with clotted cream and strawberry jam are brought around continuously by servers. Refills of tea and plates are provided upon request. While I prefer the afternoon tea service aboard Cunard Line ships, the tea service on the Viking Star was excellent. The Atrium, in the middle of the ship, extends through three decks, Decks 1, 2 and 3. 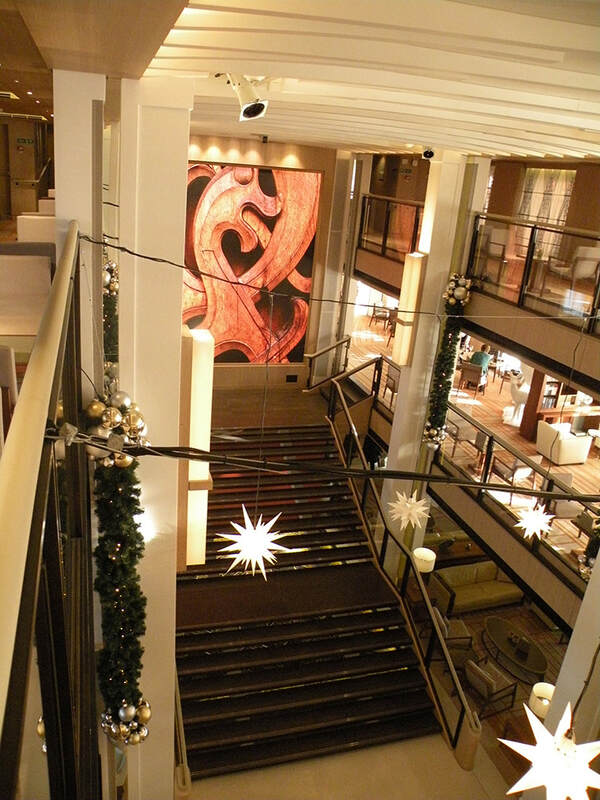 There is a broad staircase between Deck 1 and Deck 2 that is reminiscent of the staircase in the atrium on Celebrity Cruise Line’s Millennium class ships. On the port side of Deck 1 of the Atrium, there are desks in one area for shore excursions and in another area for guest services. ​On the starboard side of Deck 1 of the Atrium, there are shelves with books, comfortable seating and a bar. There is no formal library, but there are several areas, including the lanais on each side of the Wintergarden on Deck 7 and the upper level of Explorers’ Lounge on Deck 8 overlooking the bow which have bookshelves with a limited number of books. Most of these books deal with topics related to the various ports the ocean cruise ships visit. There are several books relating to Thor Heyerdahl and his journeys in the upper level of the Explorer’s Lounge, together with models of Kon Tiki. Among some of the other ship models in this area is one of the Clipper Line’s Stella Polaris from 1927. At the forward end of the port side of Deck 2 of the Atrium is a large model of the Viking Star. Behind it is the future cruise office, which will take reservations for ocean cruises and river cruises. A model of one of the river cruise ships is in this office. There are two staircases and elevator banks on the ship. Just aft of the Atrium is a bank of four elevators. A separate staircase is aft of the elevators. The second elevator bank contains just two elevators and is located aft of the spa on Deck 1 and the theater on Deck 2. There is a staircase adjacent to this elevator bank. The gift shop is on the starboard side of Deck 1 just forward of the Atrium. Another two gift shops are located on either side of Deck 2 aft of The Theater. Also on Deck 2, forward of the Atrium, is Torshavn, a small cabaret lounge for after-dinner drinks and music. The décor of the ship is, as to be expected, Scandinavian modern, with a lot of blond woods and blue, grey and beige carpeting and upholstery. However, there is a smattering of dark brown wood in the desks and bookcases in the shore excursion office and the guest services office. The overall impression is of understated elegance. In the middle of the ship on Deck 7 are the Main Pool and a hot tub, both covered by the magrodome. At the aft end of this room is a screen for showing movies under the stars in good weather and under the magrodome in cooler weather. Loungers surround the pool. The promenade on Deck 2 is a continuous circuit of the ship, with four laps equaling one mile. However, this promenade is for walkers, since it is not overly wide and the forward end is especially narrow. On the enclosed forward end, there are three large windows looking into a room full of bollards, capstans and anchor chains. There are no deck chairs on the promenade. Joggers can use the aft end of Deck 8. There is a Sports Deck on the forward end of Deck 9. This is more of an observation area than anything else, but there is a miniature golf putting green and a few exercise machines around the base of the forward mast. The spa area is at the forward end of Deck 1. The spa includes massage treatment rooms, a small indoor pool, a sauna and a Snow Grotto, which did indeed have snow. The use of the pool, sauna and Snow Grotto is free to all, on a space available basis. There is a fitness center with a good selection of workout equipment and a salon aft of the spa on the starboard side. At the forward end of the ship on Deck 2 is The Theater. This room extends the width of the ship and there are six rows of semi-circular tiered seating. In addition, there are seats against each wall and in two alcoves at the back end on the port and starboard sides. These alcoves can be closed off for use as cinemas to show movies. There are no structural beams in The Theater, so sight lines are excellent. coming port. There were also movies shown in The Theater and in the Main Pool area. Entertainment at night was also limited. During our first evening, there were four members of the Accademia in Rome who sang operatic arias. On the second night, the Captain’s reception was held in The Theater. Captain Erik Saabye greeted each passenger individually. On the third night, there was a Beatles tribute band who performed on a stage in the Main Pool area. I enjoyed this very much, but it only lasted half an hour. The rest of the hour was filled in by the ship’s resident singers, one male and one female. They were very good, but they did not continue with the Beatles theme. On the fourth and sixth nights, Petrina Johnson, a singer who has performed in musicals in London’s West End, sang a variety of show tunes. On the fifth and seventh nights, movies were shown in The Theater. There were no production shows, dancers, comedians or magicians in the evenings. Among the other signature features of Viking ocean cruise ships, there is no casino, there was no person taking pictures at any event or venue aboard the ship at any time and there were no sales of merchandise outside the shops or in the Atrium. The passengers tended to eat early and go to their cabins after dinner. The bars were not crowded after dinner. The stateroom was pleasantly decorated. The carpet was a grid of dark blue squares off-set by light gray centers. There was a blond wood desk against one wall. Part of the top lifted to expose a lighted vanity mirror. Two barrel chairs upholstered in off-white vinyl were against the opposite wall, in front of which there was a two-foot wide occasional table with chrome legs. This table had an upholstered top, one half of which was black vinyl and one half of which was a striped fabric. A large flat screen television was on the wall directly opposite the bed. The stateroom contained a k-cup coffee maker. On the veranda were two straight-backed chairs in plastic wicker and an opaque glass table about two-feet square which was the perfect height and size for dining al fresco in warm weather. The bathroom was large, with heated floors. The shower enclosure was approximately 30 inches square, with a glass door. A small bench along one wall of the shower provided a place to put toiletries. Drawers on either side of the sink allowed us to store personal items we did not want to leave on the shelves or on the counter. The closet in the stateroom had sliding doors, so that when one side was open access was cut off to the other side. There was a limited number of hangers. Drawer space in the stateroom was limited. I was reminded of the limited storage space found on Cunard Line’s Queen Victoria when it entered service, before they added large drawers under the bed. In my opinion, passengers would find it difficult to store clothes for a cruise longer than two weeks. The television provided the usual cable news stations, but also offered a selection of free movies and various television series. We were able to pick and choose which episodes from the six years of Downton Abbey that we wished to see again. The ship rode very smoothly through the water. We were fortunate that we did not run into any bad weather during our cruise. Below: The Atrium (Photos courtesy of D. Hume).